What is now the St. Johns River valley, indeed all of Florida, was beneath a shallow sea. 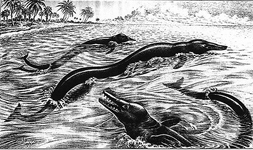 Florida's limestone substrate contains many vertebrate and invertebrate fossils as well as fossils of sharks, sea cows, whales, and porpoises that swam the Eocene seas. Areas in north and central Florida, including the St. Johns River area, emerged above sea level for the first time. Terrestrial animals migrated from points north and west to occupy the newly formed dry lands. The Miocene Epoch By the end of the Miocene Epoch the current outlines of North America were nearly defined and larger areas of Florida became hospitable as terrestrial habitat. Fossilized remains of mastodons, horses, camels, rhinos, as well as turtles, snakes, and the oldest known alligator species attest to the diversity of species during this period. Fluctuations in the climate produced multiple ice ages, causing sea levels to rise and fall with cyclical melting and formation of ice. As the sea level dropped, water trapped behind a long barrier island formed brackish lagoons that began flowing north, forming the St. Johns River. 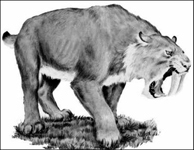 Toward the end of the period saber-toothed cats shared the region with Paleoindians who hunted animals such as the mastodon and giant sloth. The three phases of the Archaic Period - Early, Middle and Late - are marked by the development of spear points, arrowheads, tools, camp placement and cultural changes. Native Americans during this period were primarily hunters and gatherers. Shell mound building, pottery and textiles marked the late Archaic Period. Archaeologists named this 2000 year period after the river that sustained the Timucuans, a complex Native American culture that flourished along it's banks. Tens of thousands of natives lived along the river in large villages in which agriculture and trade flourished. 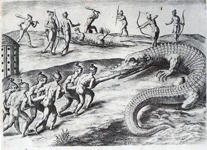 Within 200 years after first contact with the Spanish in 1513, the Timucuans had largely disappeared due to disease and persecution brought by the Europeans.